Whether you want to highlight a few features of your landscape or enhance the entire area, you can achieve your goals with landscape lighting. This service allows you to strategically light up the exterior of your home or business to beautify it and help certain features stand out during the evening and night. 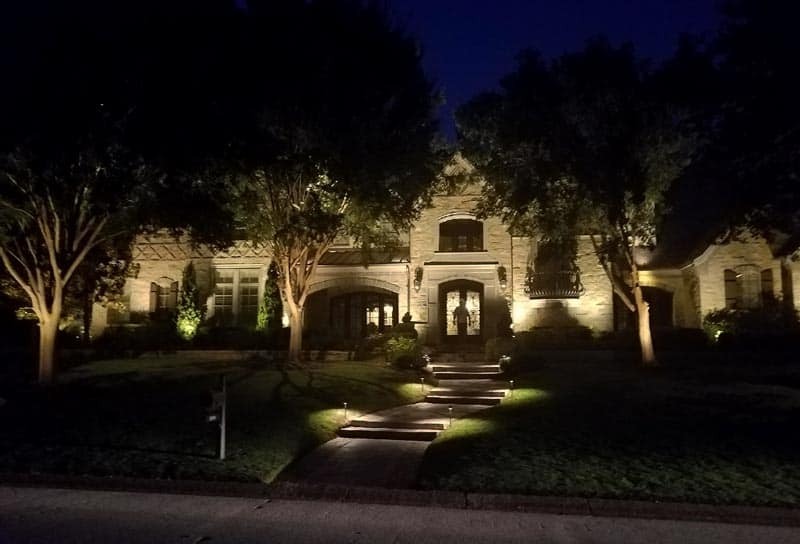 For quality landscape lighting in the San Antonio and Austin areas, you can rely on the expertise of Enhanced Outdoor Lighting & Design. Landscape lighting offers many benefits. Since you put so much effort into well-designed landscaping, you can help it look its very best and ensure that you, visitors, and passersby can see it any time of day or night. In addition to boosting the beauty of your landscaping, lighting in the front yard will enhance the curb-appeal of your property. This is a great benefit whether you plan to sell your property or simply want to give the best impression possible. Nonetheless, outdoor lighting can also enhance private landscape areas for you to enjoy. LED lighting is the perfect fit for landscape lighting needs. It allows you to create a soft light that provides a natural appearance to match the outdoor world. This gives the right style for highlighting trees, flowers, and other wonders of the natural world. At the same time, LED lights offer the option of brighter light to strongly illuminate certain areas. In addition to providing a naturally appealing look, LED landscape lighting also sends light beams in a set direction instead of shining them everywhere. This helps us keep your outdoor lighting on specific focal points. Plus, while other types of light send off heat all around the lighting, LED landscape lighting stays cool. It tends to provide an efficient method that provides strong beams of light without using too much energy. Also, this type of lighting is durable and long-lasting to withstand harsh outdoor conditions for a long time to come. Overall, the combination of durability and high-efficiency makes these lights a great value. If you want an outdoor lighting option that beautifully enhances your landscaping without using too much power, you’ll want to try low voltage landscape lighting. This type of lighting can drastically reduce the amount of voltage the lighting uses, so it causes less of a drain on your property’s energy and your wallet. While it requires less voltage, as it is transformed to 12 volts from 120 volts, this type of lighting still provides a strong beam that brightens your outdoor foliage. Plus, it often comes with the added benefit of having a timer that you can set to turn on and off automatically. Low voltage lighting is an excellent choice to fit an environmentally friendly landscape design while still getting the visual appeal and positive impression you’re looking for from outdoor lighting. How can you use landscape lighting around your home or business? We can create a design specific to your property to enhance its best features and achieve an eye-catching look overall. Nonetheless, we would usually use this type of outdoor lighting to highlight large trees, as well as smaller plants like bushes, vines, and flower beds. Landscape lighting could also be used to showcase structures that are incorporated into your landscape design, such as a waterfall or fountain, sculptures, a walkway, or decorative rock structures. It can highlight the lawn as well. Look at local properties that incorporate lighting into their landscape designs to see how it can be done well. You can also search for ideas in magazines, websites, and our online portfolio. 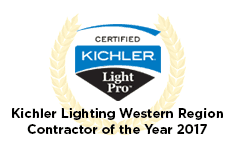 A company needs plenty of experience and expertise to achieve the best landscape lighting results. At Enhanced Outdoor Lighting & Design, we offer an expert lighting team to provide high-level designs. We understand that outdoor lighting isn’t just about placing some lights around the property. It takes planning and positioning. With our designs, you will often not notice the light source itself but will only see the area that it is highlighting. In addition, we adjust our lighting plans to fit the specific environment in your landscaping. For example, we know that tree lighting requires a certain setup to prevent you from needing significant adjustments as the tree grows. In the same way, we provide adjustable lighting that you can change as your flowers and bushes grow. We also make sure that we offer durable lights that can handle highly watered areas, and we even determine how the light of the moon will affect the landscape lighting at night. We use our experience to target the landscaping lighting to your specific outdoor environment. To discover how our experts at Enhanced Outdoor Lighting & Design could improve the look of your outdoor area through landscape lighting, contact us for a free consultation.